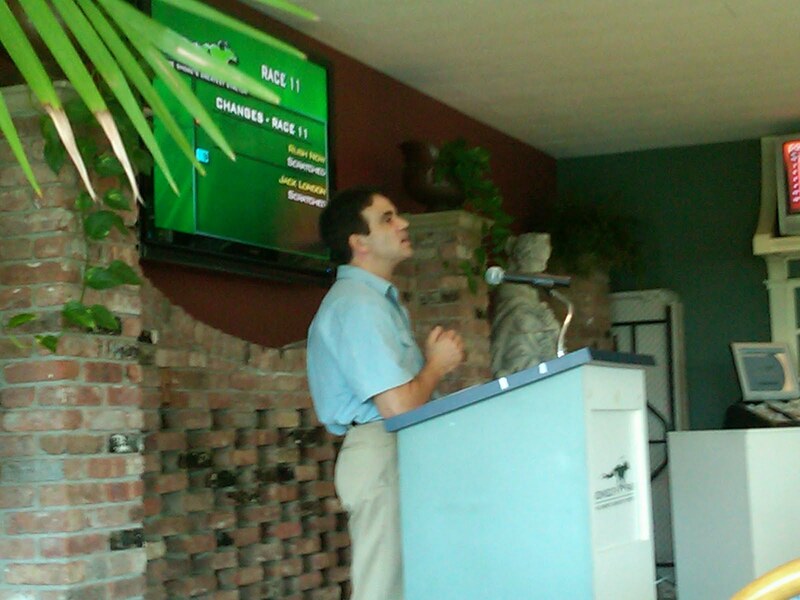 The organizers of Saturday's Thoroughbred Ownership 101 seminar at Monmouth Park deserve much credit for shedding light on a dream of many horseplayers or track goers: thoroughbred racehorse ownership. 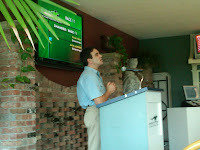 H. Robb Levinsky, founder and managing partner of the Kenwood Racing, offered about a 45-minute presentation about the numerous ways people can get in the game. About 25-30 attended the forum at the Monmouth Park clubhouse, and clubhouse admission, the seminar and track program were free to those registered in advance. Mr. Levinsky's presentation was anything but a hard-sell of his product; instead, a candid look at the steep expense and different ways to approach thoroughbred ownership, from starting one's own stable ($100k or more) to forming partnerships with friends or family to joining a "syndicate," where owners essentially buy a share of a group of horses, kind of like buying a mutual fund, for a one-time fee and split the earnings. Kenwood's syndicates typically cost $5k or less. The economics of ownership were takeaways for me, especially the cost at particular tracks: about $40k per year (per horse) at an elite track like Saratoga, $25k-$30k at Monmouth Park and $18k-$20k at smaller venues. Otherwise, like any investment, Mr. Levinsky (a CPA as well) encouraged the audience to treat the investment as an investment (even if owning a horse for fun), and consider legal and structural issues, knowing when to buy and sell, and extensively interviewing and knowing the people running the barn. Mr. Levinsky quashed any notions of grandeur for anyone thinking that the ownership game is about huge profits and setting up camp in the Winner's Circle, for most horses lose money. To be sure, Mr. Levinsky set a 20% win-50% in-the-money benchmark for a stable to pay the bills -- a daunting assessment. As well, he cautioned about knowing when to buy and sell; in one example, Mr. Levinsky noted a $25k claimer he held too long and lost money in placing the horse in overaggressive spots, before it was claimed for around $8k. On the other hand, a claim on the successful Hermosillo has worked out especially well for Kenwood. In my view, everyone has a different set of motivations for entering the ownership game, but much like investing in the stock market, the decision comes down to one's financial standing, risk tolerance and passion for the investment. From the smattering of questions from seminar's attendees, it is clear that people are still passionate about ownership, and in my view this is a good sign for an industry reportedly on life support but seemingly taking at least baby steps toward encouraging new blood to get into the ownership game.